Just back from a guiding 10 out of the last 12 days at Crowley Lake. The lake is fishing very solid right now with many 20 to 50 fish days. The algae bloom has come on strong and is in the stringy stage, however its only a few feet thick so the wind will blow the algae around and clean up the water very nicely in most cases. 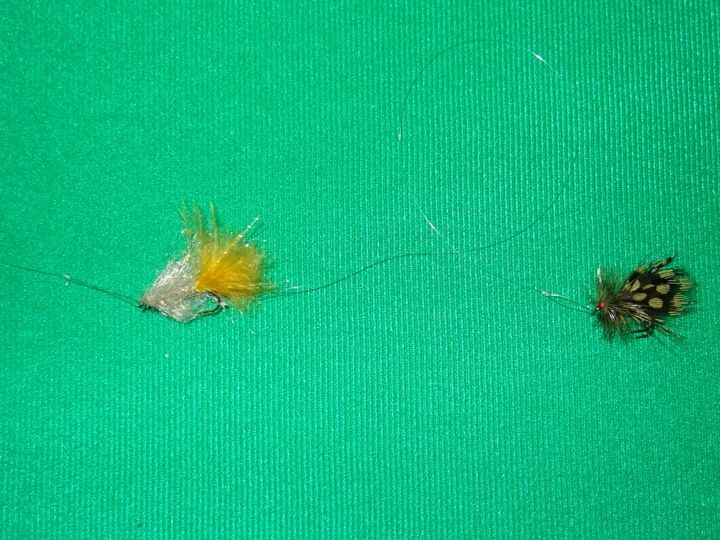 When dealing with the algae situation, remember to use very thin profile flies, coated with additional coats of Sally Hansens hard as nails and use a couple of size AB split shots to help get it down thru the goo fast! The fish are still hanging out in McGee Bay, You will find a lot of browns if you get up tight to the weeds in 10 to 12 feet of water. 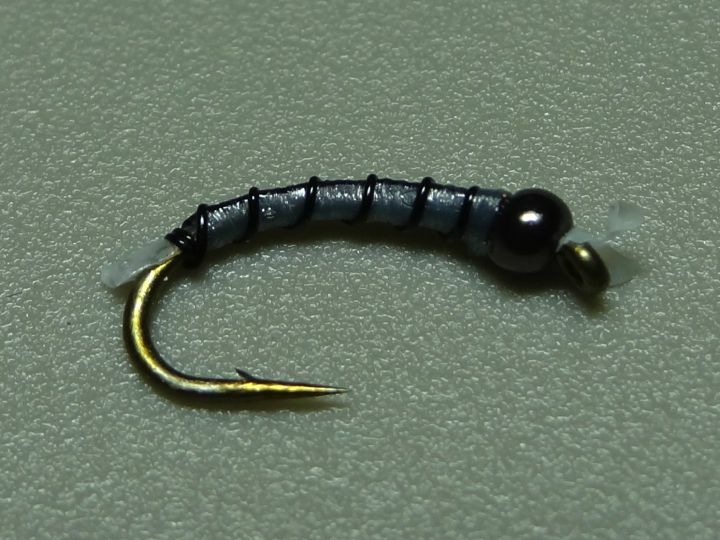 You can be very successful throwing midges, perch fry, damsels and leech patterns. I have been hitting bigger fish early in the morning and then moving on to the North End, Green Banks area and North Landing areas. The fish in the North Landing areas are spread out and moving around from day to day and hour to hour. You will find about a 70% Cuttthroat ratio to 30% rainbow in the larger fish over 15" and I have only had 4 browns landed in my last ten trips to the North Arm but they will come! I have been very successful fishing away from the weed edges, away from the crowds and finding humps and depressions out in the bay that are holding a lot of fish. I have had success in 9 feet of water all the way out into 17 feet of water. The last two days guiding anglers had over 40 fish to the net with 80 or more grabs. The fish are in three different catagories, small (6' to 12") medium (14" to 17") and very large (20" to 24"). We have had a dozen fish each trip over the 20 inch mark including multiple fish over the 23" range and larger with the excepting of one of my last 10 guided trips. I have been averaging about a dozen legals almost every single trip! Same set up in North Arm, midge on the bottom and a perch or damsel pattern as the top fly. Some anglers have moved back into 9 feet or less or water and fishing larger holes in the weeds with leech or perch patterns hanging about 6 feet under and indicator in 8 to 9 feet of water. Its very crowded back there and I am hanging back in the middle or edges of the bay and keeping a very good pace with quality fish and less crowds. The water temps have dropped to around 65 surface temperature in the mornings and will continue to drop because of the nights and mornings being much more chilly. Make sure you have your jackets on for the ride out in the early am, you will need them. We have seen some throat samples that have been coming up with daphnia, this means the bite may shut down for a while but we will have to see, its going very strong right now. My throat samples of about a dozen fish have only found three out of the twelve fish sampled with daphnia so lets pray for the best! My midge patterns have been staying very consistent, starting with blood midges 4" off the bottom, when this slows I switch over to a Copper Tiger 7" to 12" of the bottom and when that slows the grey midges 12" to 36" off the bottom are working well! Sometimes they want the white head, sometimes they don't so keep switching and don't be afraid of change. The strip bite is off and on, sometimes I see the float tubers hammering fish and then not getting many at all. We are using small punk perch, horn bergs, low-bergs, haresears and perfection perch patterns with success. Don' forget a small pheasant tail nymph with a flash back will look like a small perch also. The float tubers are also getting very aggressive around the guide boats that are landing a lot of fish. I am a float tuber with thousands of hours out on the water and I have never been asked to move away from a guide boat or any other boat for that matter. Use proper judgement for space and PLEASE BE COURTEOUS TO OUR CLIENTS AND DON'T RUN OVER OUR INDICATORS! 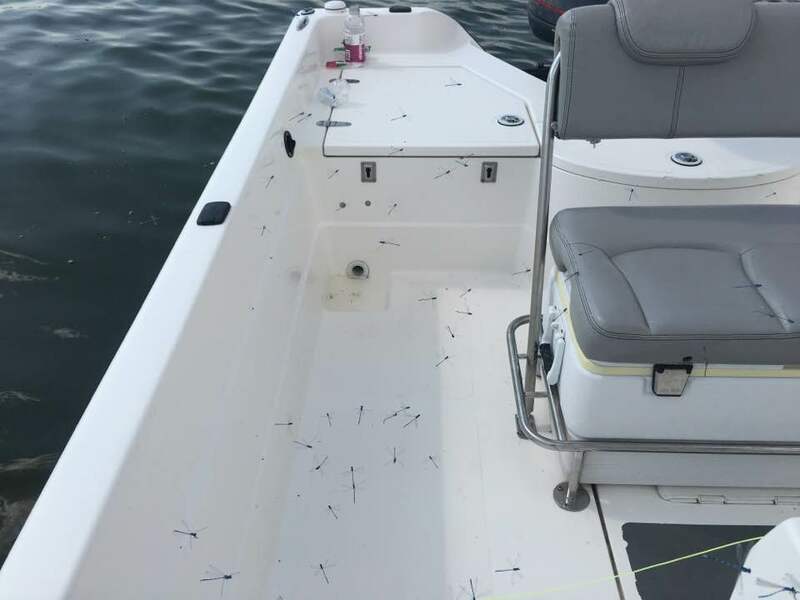 You can fish behind our boats as much as you want, far enough away so we can't hit you with our back cast but PLEASE DON'T RUN OVER OUR INDICATORS! We all want to share the water, lets all be courteous to each other out on the lake! 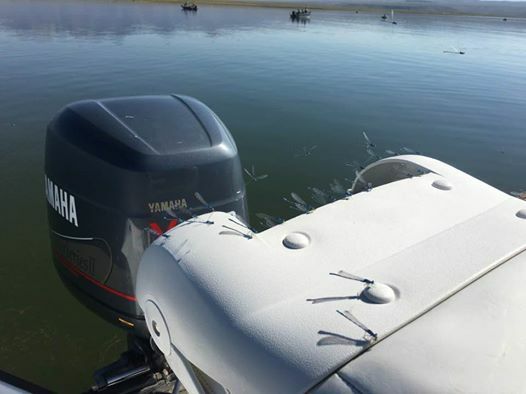 I am very excited about a very strong fall and great finish this year for Crowley Lake! Hope this helps anglers and good luck and be safe out on the water! This year, the Stillwater Classic will be held on Saturday, August 13th. Since the fish camp began running the Tournament in 2013, it has become a high-light of our summer. We very much appreciate all of the participants, volunteers, and community support. We look forward to the event each year and have welcomed the suggestions and make improvements year after year. This year, we have a few major changes! For the first time we will be holding a separate Ladies, as well as a Junior (16 & under) competition!!! There will be separate prizes and trophies for these additional categories, as well as a reduced entry rate of $50! We have also commissioned an artist who is busy making some awesome and unique trophy plaques that all 1st through 3rd winners will receive. Please tell your friends to come join in on the fun! Fishing has been for most on the tougher side if your note being guided and the fish are beginning to get very finicky because of the amount of anglers that are fishing the small area of McGee Bay where the creek runs into the lake. 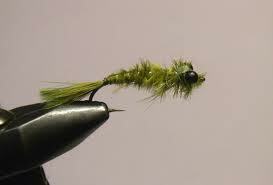 You must be patient and constantly change your midges out every 15 minutes or so if you are not getting enough grabs. The fish are also concentrating now on the millions of perch fry and damsel nymphs up against the edges of the weed beds. 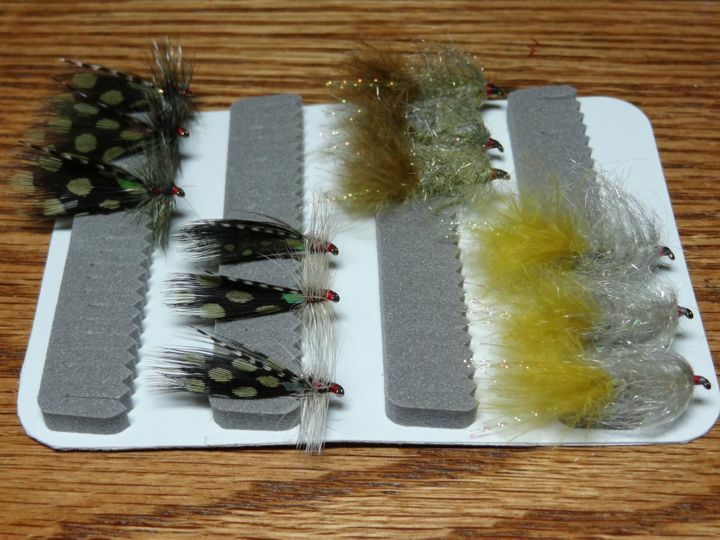 You can also be successful in rotating your perch fry patterns to see which pattern the fish are keying in on that day. 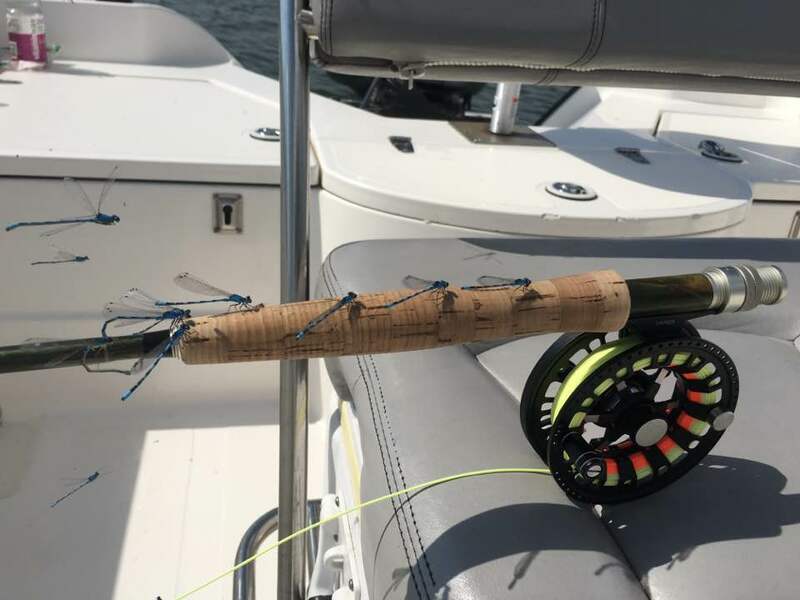 When fishing in a tournament environment like the Classic, I have found that you have more success by trying to break off from the pack and fish away from other anglers if possible. Fish as far inside or outside as you can from other anglers and if you can fish away from everyone on the edges. This has given me and other winners the edge in the past to win these tournaments. Even with the fish keying in on the fry, the fish are very active on the midges right now. I have been starting out with Black/Red with a Copper head in the morning and them switching up to the Grey patterns once I see a few midges start to come off the water or I slow down on the takes. The Grey and red with a white head has been excellent for me before gone to the Grey and black with white head. Be patient and if you can corner an area where no other anglers can get in front of you, fish as close to the weed edges as possible. If you can find a small depressions or bowl that just goes back into the weeds just a few feet, fish inside out just outside this area where fish will be moving thru. If the wind is blowing in from the weed line, cast up against the edge of the weeds and allow your midge to move back to you in the current. This makes your presentations look much more real and also lets you know if your midge is getting caught up on any stickups along the bottom. 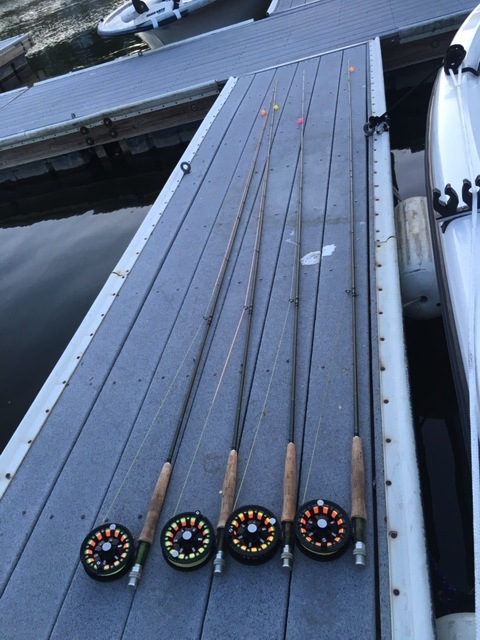 If your indicator is not coming back, move your fly up about 3 inches and try again until it comes out smooth and not catching up on the lake floor. My best words of advice are this: DO NOT BE AFRAID TO MAKE CHANGES OFTEN AND MOVE AWAY FROM THE PACK. You will be surprised to see you will catch more and larger fish when you are not around other anglers. Anglers, if you want to try your hand at fishing damsel nymph patterns, now is the time to get to Crowley! We have thousands of damsels coming off and the fish are really cashing in on the damsel fish food factory that Crowley has to offer! Dust off the float tubes or any fishing platform you own and head out to the lake! You will see literally hundreds of fish aggressively attacking the damsel nymphs from early morning to last light! The fish are agressiveley attacking the damsels right up against the weed lines. In the photo you can see that the weed beds have become large matted platforms for the damsels to climb out on and become adults. Even though the water depth outside the weed lines are 14 feet, you will still want to fish the upper water column, no more than three feet deep. The fish are cruising the weed lines and having a field day, dinning on these little tasty treats. Now is the time to bring all of your favorite damsel nymph patterns. Fish them with a floating line with a 15 foot leader (I prefer straight 3x or 2x) if you can get away with it and super slow retrieves, sometimes even not retrieving at all but allowing the damsel pattern to just hang in the high water column and move with the side current. I cast sideways into the wind and allow for the leader to slowly sweep until it is completely down wind and start a very, very slow retrieve back towards the weedline! 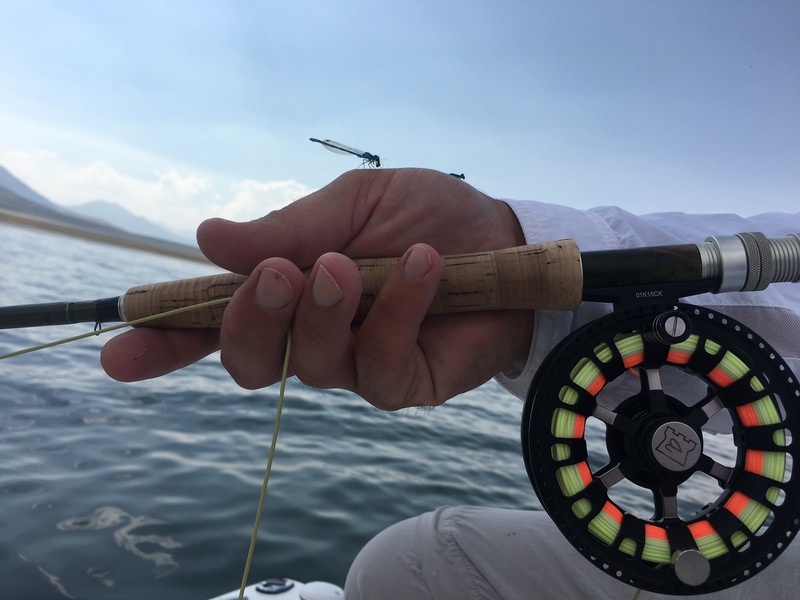 The most important part of this style of fishing is that you must us a slip strike and be very supple with your hands because the takes are so aggressive, the fish will break 3x and 2x right off in your hands if you lift the rod to quickly and get too tight! I like longer rods, 10ft rods that have a very soft tip to help with these aggressive strikes the fish will give you on the damsel patterns. 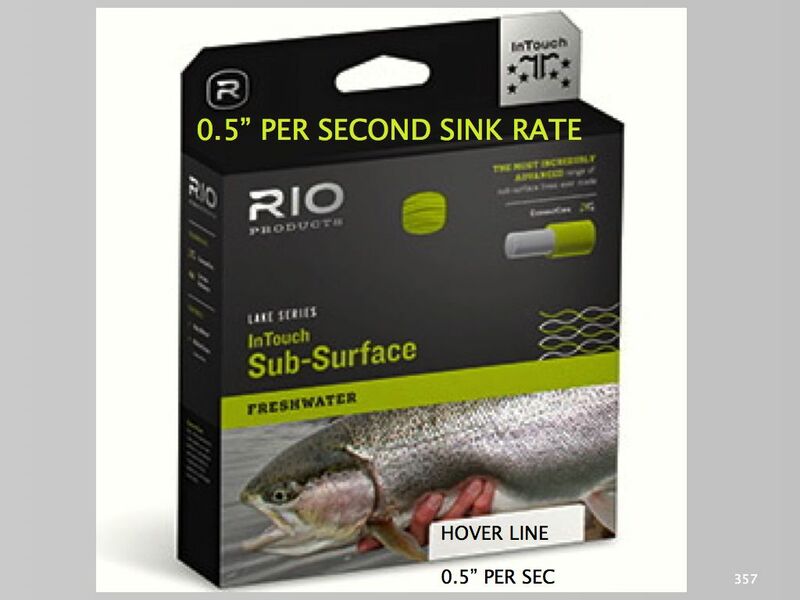 If you are not comfortable or not having success with a floating line, a hover line and a true intermediate line that sinks at 1.5" per second can work also but will not allow you to use the hang method of just letting the patterns just sit in the hight water column. 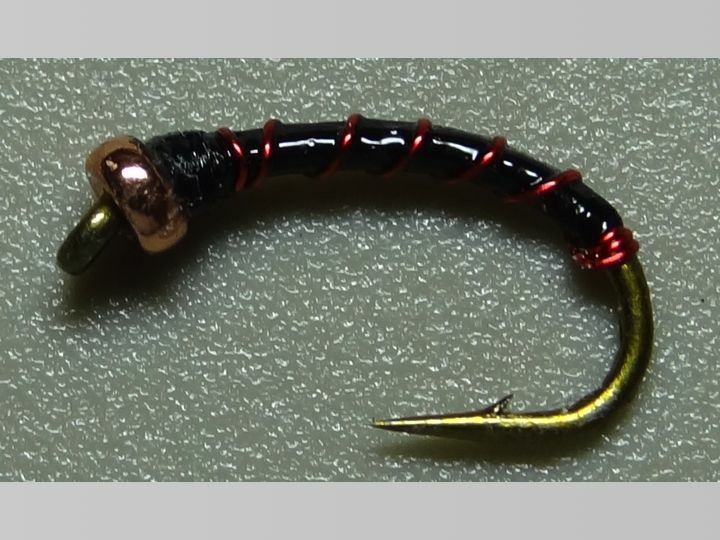 Another way to fish the damsel is to hang your patterns about three feet under an indicator, I prefer a clear indicator and then fish you midges or chironomids a foot off the bottom down the length of the leader system. This is a perfect technique at Crowley that produces big numbers of fish and many very large 20+" specimens. I will be targeting some more of these big beautiful trout at Crowley this weekend, after my guide trips and looking forward to using some of Stillwater Guru Doug Ouellette's famous damsel patterns. I hope I can have half the success he has fishing damsels at all of the stillwaters he fishes, including the stellar days he has at Davis Lake. Look forward to seeing you out on the water soon! This is much shorter than my last website but everyone who still goes to the old site will automatically be transferred to my new website! Adam Minic, President of Seo-Idaho www.seoidaho.com is fantastic at building you a state of the art website and also built my company logo. 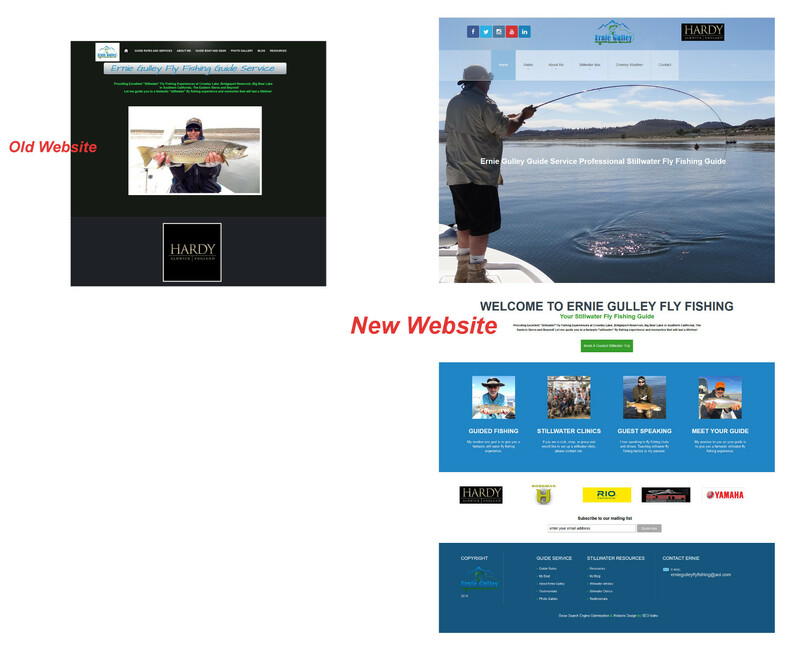 I highly recommend Adam and his company to build you exactly the web site and logo you need for your business. His attention to detail is unsurpassed by anyone in the industry. Breakdown of the weekend at Crowley! Saturday my guide trip cancelled so I was able to go out and fish for myself! Big Hilton and Sandy Point have been setting the pace for most anglers, however I wanted to get away from the crowds and decided to fish Six Bays. Since I didn't have a trip I didn't get onto the lake until after 8am! 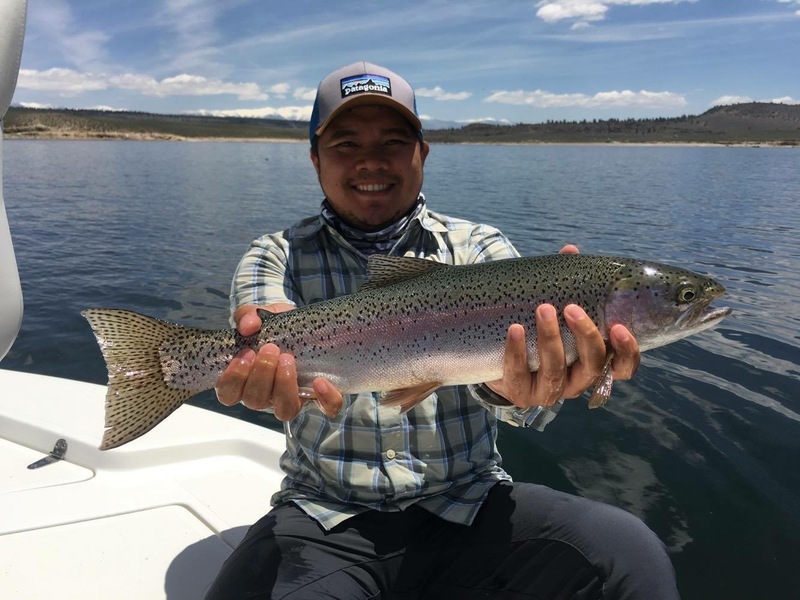 Once I set up on the deep drop off, anchored in 15 feet fishing downhill into 20+ feet of water, I was immediately hooked up with a beautiful leaping 22" rainbow! 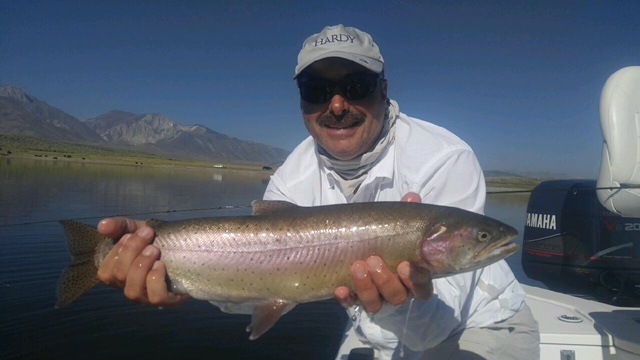 These rainbows are super hot at Crowley and will show off there leaping ability every chance the get! Not long after his release I was onto a nice chunky 20" brown and the bite continued to be steady for the next few hours, with all fish in the 19" to 22" range! I ended up with six beautiful fish and after almost an hour without take down, I decided to move back into the North Arm and North Landing/Green banks area! I had not fished this area the entire beginning of the season because Hilton and Sandy were producing well for me! Once I moved back into this area I anchored up in 17.5 feet of water. There were only three other boats fishing, including another guide boat fishing with friends on his day off! I set my depth for 12" off the bottom and made my first cast! Within 90 seconds I was greeted with a beautiful 21" rainbow doing cartwheels out of the water, wow I said to myself, that's a great start! The other guide boat next to me had a double hookup and I knew this had the looks of being special! I landed on more small 15" fish, both on the top fly, then proceeded to miss 6 take downs in a row! After missing that many takes I knew one thing from the past, I needed to move my bottom fly up higher in the water column so the fish could more easily eat the bottom fly and not the top fly. The leader was not allowing the fish to take the fly into its mouth for me to get a good hook set! I moved the indicator so the bottom fly was three feet of the bottom now and hooked a nice 17" fish in less than two minutes time! I went on a solid run of takes, going at about a 50/50 hookup to miss ratio and then the bite died! Not a grab for over 45 minutes and the weather turned nasty and all boats around me pulled anchors and left! I was just thinking about doing the same thing when my indicator disappeared and I was on again, a leaping 19" brown, who said Browns don't jump at Crowley! The bite stayed steady for another 30 minutes and the wind shifted, started to rain and I decided to head in for a meatball sandwich! After my lunch break I went back out and explored about six different areas on the lake, including a 2 hour nap in the north arm and finished up the afternoon with 7 more grabs and no fish to the net! The storm front shut down the bite but I was looking forward to my next days guide trip and the weather looking good for Sunday.